Peter Dinklage is Del, a librarian left behind in New York’s Hudson Valley following what appears to be the complete cessation of all other human life in his community. Del spends his waking hours recovering, cataloguing, and burying the seemingly endless supply of dead bodies. Without the need for any explanatory dialogue/monologue, Morano wordlessly conveys the contours of Del’s routine. To our surprise and delight, given the morbid circumstances, Del thrives in what would surely be a hellscape for so many others. He is at peace until the unwelcome arrival of Elle Fanning’s Grace, a young woman who may know more than she lets on. 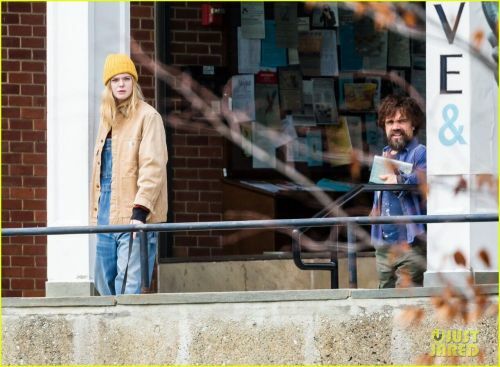 Dinklage and Fanning are, it should go without saying, highly skilled and thoroughly watchable performers who have both contributed to memorable projects over the years. Unfortunately, Del and Grace are never afforded the opportunity to engage one another in the kind of complex and thoughtful conversation that should accompany a tale with a premise ripe for contemplations of our place in the world, our capacity to welcome the stranger, and our need for love and some kind of companionship -- even if we prefer being solitary. Del’s skepticism is not the problem, but the late revelation of a suspect plot twist sets fire to the much more intriguing possibilities of a rich character study. The three principal sections of the film are so contradistinctive, each could be a self-contained short film. It does not help that these pieces diminish in quality as the movie unfolds. Despite the inherent potential for drama accompanied by the introduction of Grace as a second survivor, “I Think We’re Alone Now” is easily at its more comfortable and confident when Del undertakes his grim but important role entirely by himself during the first and most expository sequence. Many movies, from “28 Days Later” to “WALL-E,” have relished the presentation of eerie emptiness and isolation, along with the thrill of that solitude. The contradictory personality of Del -- expressed by the assertion that he ironically felt more alone before the event that killed everyone in his town -- is an avenue Makowsky’s script never fully grasps. Morano, who also serves as her own director of photography, lights and shoots the action with a sustained degree of gorgeous composition and bold contrast that deserves better than the frustrating beats of a narrative uncertain, or unwilling, to fully commit to an exploration of existential questions. Is Del better off solo? Are Del and Grace obligated to consider repopulation versus extinction and oblivion (never mind that Dinklage is currently 49 and Fanning is 20)? The movie starts to tangle with a few of these knots until the final shift realigns the entire operation, turning “I Think We’re Alone Now” into a far less satisfying experience than the one belonging exclusively to our two main characters. “I Think We’re Alone Now” opens September 14, 2018.